What a welcome bonus it has been to see the incredible growth of all plants in May’s final third, as temperatures recovered to normal and then to consistently high levels, with warm nights too. 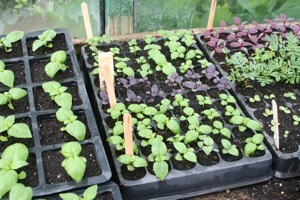 It made me incredibly busy in May’s last week when module or pot raised basil, beans, cucumber and squash became suddenly ready to plant all at once, after languishing in the greenhouse for what seemed an eternity. 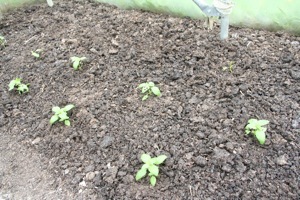 After a final frost on May 16th when I was covering potatoes and tomatoes, the temperature soared within a week to 26C. 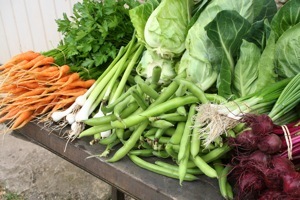 Suddenly there were also many new vegetables to harvest. 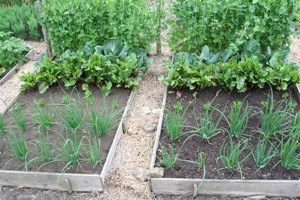 The bottom garden is filling up, perennial kale in front, garlic, lettuce fleeced, pea shoots, beans and cabbage. 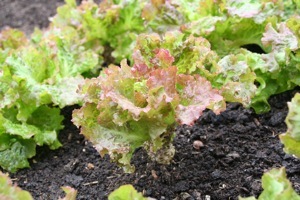 Grenoble Red lettuce are 38 weeks old, still cropping. 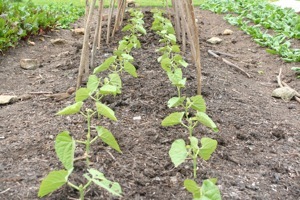 Borlotti beans planted a week ago, home saved seed. Basil planted four days earlier, slug damage near north side. Now it looks like a return to normal British weather in June, which means changeable and less sunshine. 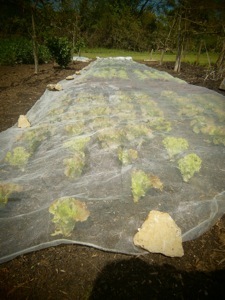 Fleece covers may still be useful for new plantings of heat loving plants such as the ones mentioned above. 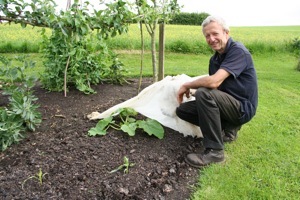 Climbing beans are hard to cover though and I also found last week that runner beans covered with fleece suffered more slug damage than some which were uncovered, due I think to fleece conserving moisture (which has been useful for lettuce in the hot weather). There is still a high population of slugs after the wet spring: their effects can be reduced by keeping ground as weed free as possible around new plantings and checking for slugs early and late, or you can set traps of beer or wooden planks or whatever, for collecting the slugs which hide underneath. I lost some basil on the north edge of a polytunnel where there must be a huge population between plastic and the bed edge; each morning at dawn I am cutting several. Basil is especially tender so be sure to plant it in rather dry soil, with just a little water around each plant until they are well established. Basil plants at different stages of growth, amaranth at back. Cucumbers and melons need care too, in fact I have planted only half my cucumbers so far and none of the melons; they were sown later than usual and are looking good after the recent fine weather, for planting by mid June, after being potted on into larger pots this week. 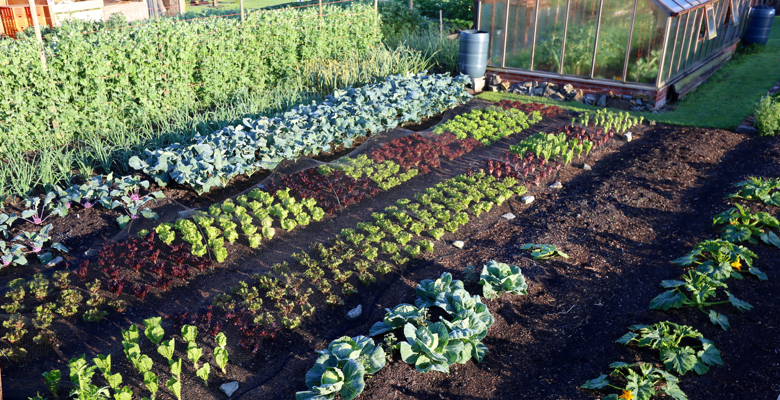 Any time this month is good for planting (of plants not seeds) most frost sensitive vegetables such as courgettes, french and runner beans, sweetcorn and cucumber, also tomatoes if you have not put them in yet. Same bed 2 weeks later, betted against birds. picked twice so far, and little weeding needed, mostly pulled as we pick. Weeds were abundant in May, after the spring rains, and we needed to do more hand weeding than usual, followed by some light hoeing, so that all beds and paths are now clean. In well run plots, this will have been the main weeding of the year, as few new seeds are there to germinate, mostly ones which blow in such as dandelions at the moment. My experiment has shown me how undug soils have less propensity to grow weeds. If you are faced with a mass of weeds, perennials in particular, it is worth considering a long term, light excluding mulch until autumn. On beds which have been recently cleared of weeds in this way, well broken down organic matter on the surface helps to diminish any regrowth of weeds and makes them much easier to pull out, or hoe, in a soft and crumbly surface – although any compost spread recently will be lumpy until it weathers. 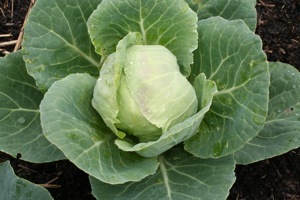 Hence my recommendation to spread it in autumn and winter, for easier gardening, but you can spread it now if need be. Paths are best kept weed free too, as clean as beds in fact, and there were some helpful posts on that in the forum. 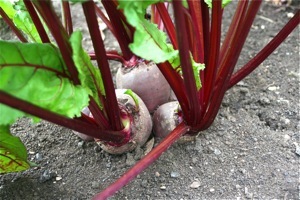 Beet Boltardy sown Feb, planted March and fleeced. 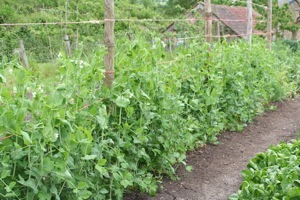 Tall Sugar Pea were sown and planted March, fleeced briefly. 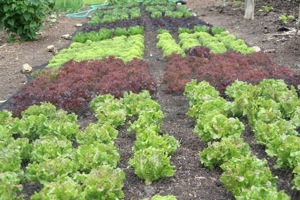 I have noticed a huge difference this spring in surface conditions of the beds in my experiment. All four beds were soft and crumbly in the dry weather of March, then in the wet weather I found the clay surface of both dug beds became incredibly sticky, making it difficult to pull weeds without a large ball of soil on their roots. In complete contrast there were fewer weeds on the undug beds (one has my own compost on top and one has cow manure) and they pulled out easily with much cleaner roots. Dug beds on left, undug on right. Photos on 31 May, similar growth but interesting differences too! Then in the dry, hot weather of late May, the dug bed’s clay surface cracked open incredibly fast, most of the fissures following breaks made by my spade while digging. 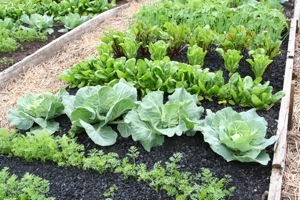 The undug beds have few cracks and growth is currently a little healthier, especially of spinach and onions, although most vegetables look quite similar, and cabbages harvested on May 31st yielded See the Experiment banner for more details of this year’s harvests to date. Beds of charcoal experiment, no charcoal on right hand bed. Bed with two inch charcoal mulch. As with May, the month’s first half has been miserable and growth is slow. However I think that as last month, the new moon will usher in some warmer, drier weather, some of the time at least. 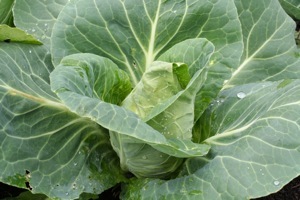 A few compensations in my gardens of the cool, damp weather are excellent growth of early cabbage, calabrese, cauliflower and spinach. Greyhound and Derby Day cabbage for example, sown February and planted late March under fleece, have made lovely hearts and stood longer than usual without splitting. 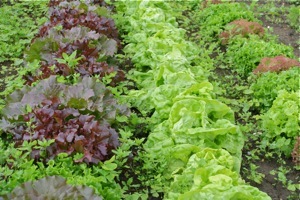 In a warm spring they would have needed harvesting more quickly, so as with many vegetables, you don’t know quite what you can pick until it happens. Heat loving plants such as climbing beans, cucurbits and sweetcorn have struggled so far but can recover quickly in warmth, as long as they survive the onslaught of slugs, which are attracted to leaves that are in poor condition. 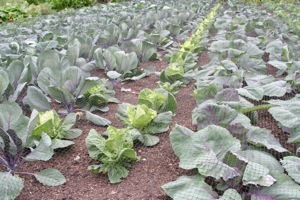 Greyhound cabbage, both sown early February in seed tray and pricked out into modules. Courgettes planted May 16th, fleeced throughout. 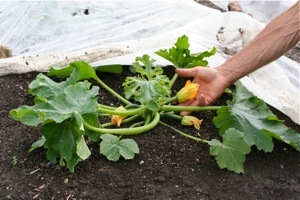 Uchiki Kuri winter squash, planted 18 days earlier. 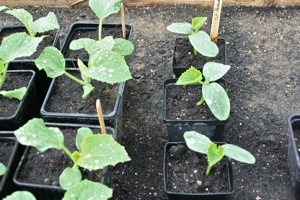 Fleece has helped some of my squashes and courgettes and insects have still managed to pollinate the courgette flowers. Be careful with fleece in wet weather though as it can harbour slugs; the cucurbits pictured here were planted in the hot weather of late May and got established before it turned wet again. 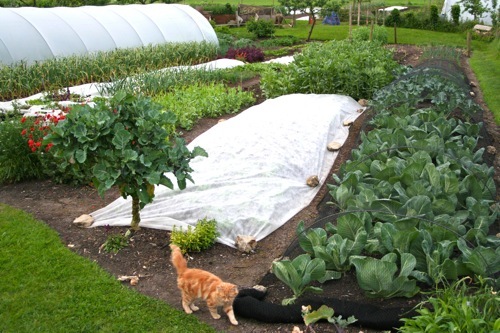 I have found the no dig, weed free approach a great asset in terms of keeping slug numbers down, and damage has been to leaves needing warmth, such as the beans and basil close to the edges of polytunnels. I still have a lot of basil to plant and you can even sow basil now for harvests in late summer, grown undercover for best results. On June 12th I pulled the first new potatoes, variety Swift, from my dig/no dig experiment (surprisingly, just one day later than last year) and there were interesting differences. Slightly smaller yield of the undug potatoes but less slug damage and much cleaner tubers. 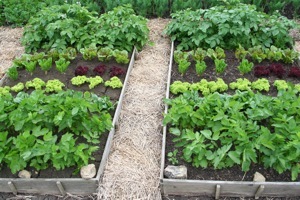 Lettuce and beetroot have been similar so far, and spinach has grown better on the undug bed. At Barrington Court. Somerset: oxalis weed et al growing between lettuce. 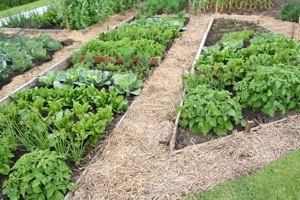 Mulched brassicas are nicely weed free. Recently I visited a National Trust garden at Barrington Court in Somerset, where the whole area is infested with creeping oxalis, which you can see amongst the lettuce, even though it is regularly hoed. Peter Belbin the gardener is embracing no dig and has adopted a promising approach by covering the soil with Mypex, then spreading and inch or two of mushroom compost on top to make it look nice! Plants are set through holes cut in the plastic and you can see how well the brassicas are growing, with NO weed growth!! just a few small perennials creeping through some edges, which need regular pulling. One hopes that after a year of being deprived of light, the oxalis will be pretty feeble, though I am not sure one is ever rid of it. Peter says that rotovating has spread it everywhere.